What better way to celebrate World Down Syndrome Awareness Day than with bright new board books from two different publishers! Both Child’s Play and Barefoot Books have new board book series inclusively featuring energetic and engaged toddlers. There are kids wearing glasses, kids of African heritage and Asian heritage, books in Spanish as well as English, and books with kids who have Down Syndrome. From Child’s Play, a brand new series of board books includes a little finger puppet in each title, durably bound to the back and poking through dye cuts on each page as well as the cover. Each book gives us a different toddler and puppet-as-playmate as the children bounce along pulling a wagon, taking a bath, getting tucked in with a bedtime story, and enjoying a meal. The volume in this “Chatterbook” series, all by Jo Byatt, titled Bib On, Bunny! 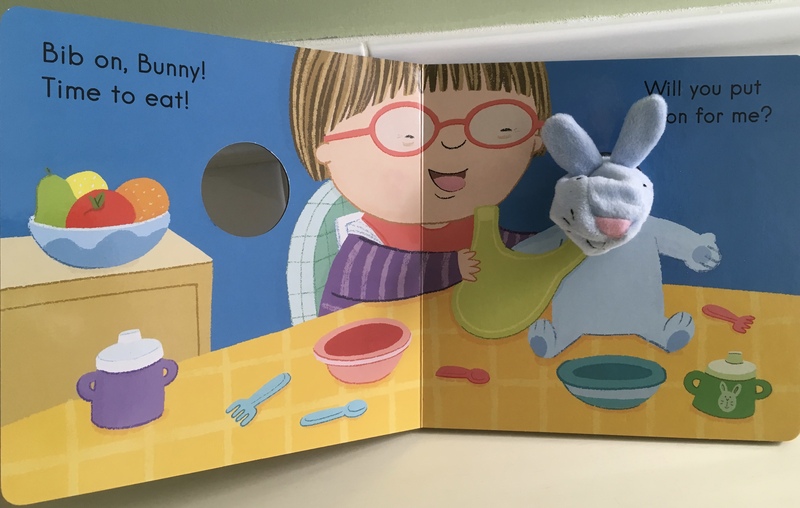 features an amiable toddler whose care to get the bunny appropriately bib-wearing before dining speaks to every little one while also showing, without remark, clear Down Syndrome features. 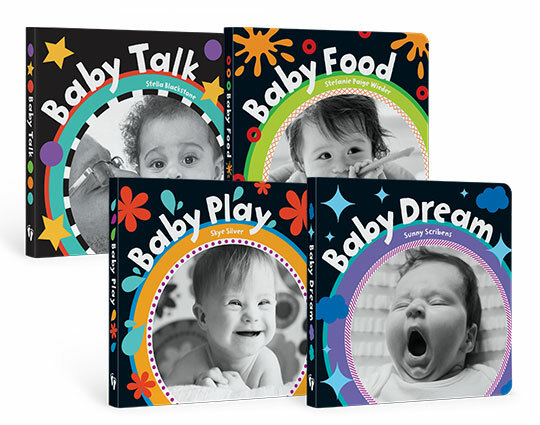 The newest series of board books from Barefoot Books, “Baby’s Day” offers four titles with the themes of Talk, Play, Dream, and Food. Each book is filled with black and white photos of a wide range of toddlers and babies engaged in the title interest, with each page spread standing alone as an image to enjoy and chat about with your little lapsitter. The Baby Play volume sports a cover baby with clear Down Syndrome features, adding another welcome layer to the wide-ranging inclusiveness of the photos. As ever, inclusive books like these are for all children, not just those whose own persons or even families might include people who look like the pictures. Share the world of toddlers with your own toddler and celebrate every kind of baby! @pubspotlight on Pinterest, Twitter, Facebook, and Instragram. ©Publisher Spotlight, a service of Myrick Marketing and Media, LLC. All rights reserved.